New Orleans Saints fullback John Kuhn pushes in a 1-yard touchdown. 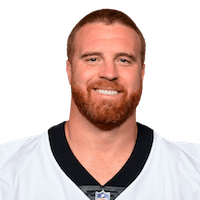 Published: Oct. 2, 2016 at 07:44 p.m.
Saints fullback John Kuhn scores his 3rd touchdown of the day. Published: Oct. 2, 2016 at 06:30 p.m.
New Orleans Saints fullback John Kuhn dives over the pile for a 1-yard touchdown. Published: Oct. 2, 2016 at 05:18 p.m.
New Orleans Saints fullback John Kuhn scores on a 4-yard touchdown reception.